When double glazing and design experts Thames Valley Windows needed to transform an existing shopfront, they turned to top aluminium specialist CDW Systems for help. 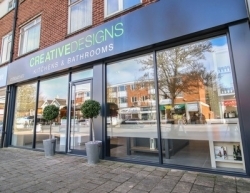 CDW is one of the UK’s longest running aluminium specialists so they were the perfect manufacturer for the Bracknell based firm to call on when they were tasked with updating the Creative Designs Kitchens & Bathrooms shopfront in Fleet, Hampshire. Paul Schofield, Design Director at Thames Valley Windows, explained: “The team at Creative Designs Kitchens & Bathrooms wanted to remodel the existing shop front to make better use of the space. We wanted to give it a modern look in keeping with Creative Designs and CDW System’s contemporary aluminium windows and commercial door system was perfect to create the desired look. “Our designer brought the front of the shop forward, in line with the neighbouring shop, which allowed us to incorporate the two existing support posts into the design. We clad the support posts and the shop front in aluminium in RAL 7016 (Anthracite Grey) for a smart, clean, uniform look, inside and out. The aluminium windows are double glazed, and the aluminium door features a full height bar handle. CDW System’s commercial aluminium doors have slim, aesthetically pleasing profiles, are low maintenance and easy to install. They are also specifically designed for heavy usage, suitable for automatic swing or sliding operation, and supplied fully fabricated and assembled with all hardware fitted. The link-up with Thames Valley Windows provided CDW Systems with a chance to go back to their roots, as Jerry Webb, Chairman of CDW Systems, explained: “The commercial door system that was used is a core product that CDW Systems as a company was built on and it is still available as part of our range today. CDW is one of the UK’s longest running aluminium specialists and has a suite of aluminium products including the Reynaers aluminium sliding folding doors and lift and slide patio doors, which are proving particularly popular. CDW Systems has recently added the innovative Smart VS 600 vertical sliding window to its product range to provide customers with even more choice.